Robert S. Totman was on-duty as an air traffic controller in New York on the terrible morning of 9/11. Just like the Twin Towers, his life came crashing down. From his own heap of ruins, the same zeal which delivered him to the planet-wide pinnacle of ATC has now taken him to an apex of spirituality that strips the spot-light from the greatest of terrors, giving attention to unshakable security. Partly because of (and after) 9/11, he began seeing future events, secrets about others and courses of action to help people have well-being instead of disaster. Formerly an air traffic controller, author Robert S. Totman and his wife Susan are missionaries with four children. They are gifted speakers who consider invitations to anywhere, pioneers who have planted a community church in North Dakota, and founders of Bethesda Global Ministries. They delight to see praise to God erupt as the words they deliver produce tangible results to the benefit of their listeners. Visit Robert at www.RSTvictory.com to learn more or invite him and/or Susan to come and speak at your event. 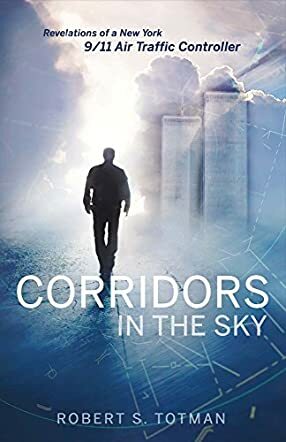 Corridors in the Sky: Revelations of a New York 9/11 Air Traffic Controller is an autobiography that comes across as an insider’s account of one of the most grievous tragedies in history: 9/11. As an FAA Air Traffic Controller, Robert S. Totman has the uncanny ability to direct air traffic across New York Center Airspace. But his life would be altered dramatically as he witnessed a hijacked plane disappear from the air and the bombing of the Twin Towers immediately after. The search for and embracing of the truth became factors that would help him heal and reclaim his life from the devastation caused by the tragic events. This is a story that will come across to most readers as an eye-opener, a startling revelation, and an irresistible inspiration. Corridors in the Sky: Revelations of a New York 9/11 Air Traffic Controller might be Robert S. Totman’s story, but it is the story of many people whose lives have been affected by tragedy, a story that mirrors and addresses the joys and fears, the hopes and difficulties of millions of people trying to find meaning in moments of adversity, and those struggling to rise above the rubble of life. The 9/11 events served as a catalyst that compelled the author to look at his life, and life in general, with honesty and to hear a voice inviting him to dig deeper. Robert’s book could be entertaining, but it offers powerful insights and lessons for men and women who have been deeply hurt and in need of healing. The book can be read as an answer to the oft-neglected question: What does it take to rise after falling from the peak of success? In clear and beautiful prose, the author lays bare the secrets of his life and allows readers to find answers to the many questions they fear to ask. What were you doing on September 11, 2001? Robert S. Totman, author of Corridors in the Sky: Revelations of a New York 9/11 Air Traffic Controller, was at his work console, settling in for another routine day as a highly qualified and respected air traffic controller of the congested skies over New York City. As it happened, not just for the 2977 people who died that day, but for Totman and the many thousands who survived, life took an unforgettable turn. In Totman’s case, that turn was a badly needed jolt from a self-indulgent existence that might have cost him everything, including his own family and life. In an easy-going, narrative style that is most enjoyable, Robert S. Totman engages the reader from the first chapter where he shares his love of surfing as a carefree teen who cares for little more than riding the waves. He thrives on the adrenalin rush, and as he matures, he continues to seek that rush in other ways. Totman joins the military and begins training to become an air traffic controller. He proves to be incredibly gifted at his job and swiftly rises through the ranks. After 5 years in Puerto Rico, he graduates to working with the FAA in New York. Life is good for Robert S. Totman as he spends his days keeping an eye on the corridors in the sky, and his super high salary allows him to live the high life, in more ways than just financially. Ever seeking that rush he loved as a teen, he gets into booze, drugs and a long-term adulterous affair. Inevitably, his life moves into a downward spiral, and the day after he files for bankruptcy, the tragedy of 9/11 and the months thereafter shake up his world in more ways than one. It is at this point in Corridors in the Sky that Robert S. Totman’s life does a complete 360, and for the rest of the narrative, we watch the emergence of a very different man. Totman discovers the one thing that fulfills his needs in the way career success, money, and indulgences never could. Totman discovers God. The remainder of Totman’s story will resonate strongly with all who have hit rock bottom and look to lift themselves out of the depths through faith. Today, together with his wife, Robert S. Totman travels around and brings the word of God to those who want to hear it. And these are the readers who will most enjoy and receive the most value from Corridors in the Sky: Revelations of a New York 9/11 Air Traffic Controller. "Wonderful! Inspiring! Convicting! Worth sharing and I will!" "Couldn't put it down! Wow, how do you not sell a million copies? Best book I've read in many years." "I can’t thank you enough for your obedience in writing the book – I had been praying for a Fresh touch from the Lord. I needed to fall in love with Him all over again and have!"